Q: I’ve just updated my email address, where do I change my settings so that I can continue to receive updates? A: All you have to do is log in to your InstantEncore account and find the down arrow icon in the upper right corner of the website. From the drop down menu that appears, click on the “Settings” option. Q: I went to tag an artist on a video I added to InstantEncore, and I noticed that their last name is misspelled. How do I fix this? Should I just add a new entry? A: If you notice any misspellings in artist names, work titles, venues, or anything else of that nature, just drop us a line at support@instantencore.com with the wrong entry and the correct spelling. We will do some research to see if the existing entry should be changed or if a new one is needed. Only add a new entry if you are 100% sure that you are adding new and unique information to the database. This helps us keep everything in order and makes it easy for other users on InstantEncore to find the right information. Q: The start time for my event has changed, and I can’t remove the existing Date/Venue. How do I update this? A: Events on InstantEncore always need at least one Date/Venue listed on them. So, add the new time for the event before removing the old one. Set the Date, Time, and Venue information. 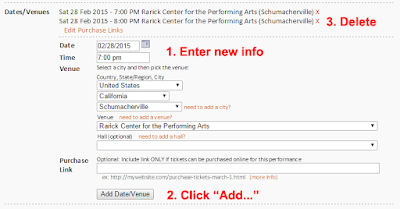 Don’t forget to include the Purchase Link if it is a ticketed event. 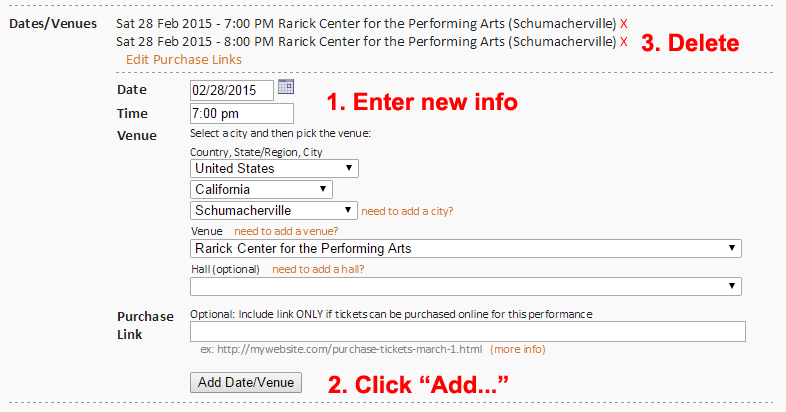 Click the “Add Date/Venue” button at the bottom. You will see it added to the list of Dates/Venues. Find the incorrect entry in the list, and click the red ‘X’ next to it to remove it. If the venue has changed but the date and time remain the same, it will overwrite the existing entry and you won’t have to manually remove anything. Q. I’ve created a custom tab in my Mobile App, but after copying some content from my Word Doc and pasting it in to the design editor, it looks all weird on my phone.. Help! A. You have to be careful when copying and pasting content into custom tabs. You can inadvertently bring over hidden HTML code from the Word Doc or website source. This hidden code might behave differently in the app and cause your content to look strange or unreadable. If you need to paste content from another source, I recommend switching to the HTML edit mode and pasting the text in there. This will strip out any formatting and leave you with just the pure text. You can then switch back to Design mode and format it, adding in line breaks, bold/italics, and anything else. It may seem like more work than just pasting directly into the Design mode, but you’ll end up saving time and headaches. Q. I love seeing how many downloads my iOS app has, but why don’t you list the Android stats? A. We would love to list the Android stats as well! Unfortunately, Google does not make it easy to bring this information automatically into the control panel. We hope they will change this in the future. We do encourage you to stay up to date with this information, so once a month we welcome you to email us at support@instantencore.com to request your Android stats. I will personally look them up for you and let you know what they are. You can also integrate Google Analytics into your App to get an idea of how many people are using it at any given time.